Here at First Baptist we know that there is a place for everyone in God’s Kingdom, and we seek to mirror that in our congregation. In no place is this more visible than in the Friends of Jesus Class. Caring members of First Baptist have designed the Friends of Jesus Class specifically for adults with developmental disabilities, that they might have a place with us. The class meets each week during Sunday School in our Activity Building for singing, fellowship, and a Bible lesson. Members of this class come from group homes and private homes from the Lumberton area. In addition to weekly meetings, the class participates in a variety of mission projects, holiday parties, an annual “Happiness Retreat” at Camp Carraway, and many other fun activities throughout the year. 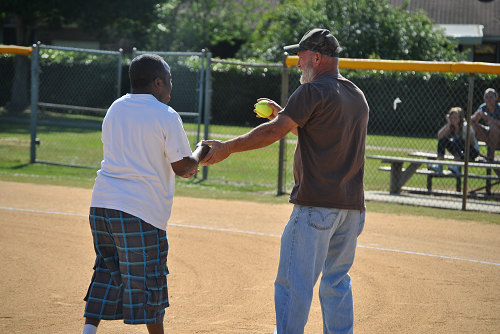 For more about our ministry to adults with developmental disabilities, please email the church office.